One-way endobronchial valves (EBVs) have been shown to relieve symptoms of emphysema, particularly in patients without collateral ventilation (CV) between the target and adjacent lobes. 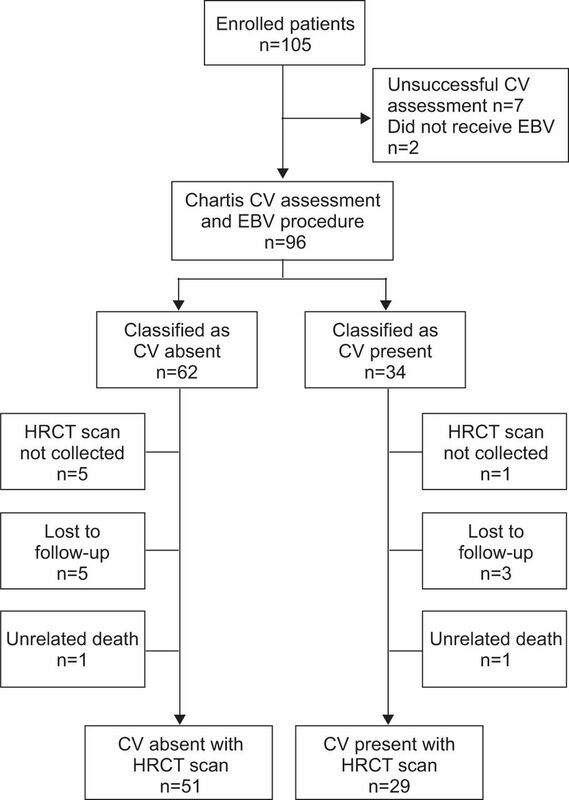 In this study, we investigated the ability of the bronchoscopic Chartis™ Pulmonary Assessment System to predict treatment response by determining the presence of CV. 80 EBV patients underwent a pre-treatment Chartis assessment. Before and 30 days after implantation, high-resolution computed tomography scans were taken to determine target lobe volume reduction (TLVR). A pre- to post-treatment reduction of ≥350 mL was defined as significant. In addition, clinical outcomes (forced expiratory volume in 1 s (FEV1), 6-min walk test and St George’s Respiratory Questionnaire) were compared over the same time period. Of the 51 patients classified as having an absence of CV according to their Chartis reading, 36 showed a TLVR ≥350 mL. 29 patients were classified as having CV, and of these 24 did not meet this TLVR cut-off. Chartis showed an accuracy level of 75% in predicting whether or not the TLVR cut-off would be reached. Those predicted to respond showed significantly greater TLVR (p<0.0001) and FEV1 improvement (p=0.0013) than those predicted not to respond. Chartis is a safe and effective method of predicting response to EBV treatment. Chronic obstructive pulmonary disease (COPD) is the fourth leading cause of death in the world, and is expected to be so until at least the year 2030 . Emphysema is a component of COPD, and is present in ∼1.8% of the global population . Emphysema is a progressive debilitating disease characterised by irreversible destruction of alveolar tissue. This results in reduced elastic recoil, progressive hyperinflation and gas trapping [3, 4]. Patients experience chronic dyspnoea, limited exercise tolerance and poor quality of life (QoL) . Patients with severe emphysema remain significantly disabled despite pulmonary rehabilitation , optimum medical therapy  and long-term supplemental oxygen . These therapies are not able to either reverse or remove the hyperinflation caused by the alveolar destruction, and therefore provide limited benefit. Lung volume reduction surgery (LVRS) involves the resection of areas of diseased lung to reduce hyperinflation and improve breathing mechanics. The National Emphysema Treatment Trial (NETT) [5, 7] demonstrated that this procedure can provide clinical benefit to selected patient groups: those with predominantly upper lobe disease and low exercise capacity. However, this procedure is associated with significant morbidity and mortality. It has been reported to have a 3-month post-operative mortality rate of 5–10% and a nonfatal complication rate of 60% . Endobronchial valves (EBVs) are one-way valves designed to be placed in the bronchi to allow air and secretions to escape the lobe, but no further air to re-enter. As a result, (partial) atelectasis of the treated lobe develops, and the lung volume is reduced, with associated clinical improvement. The Endobronchial Valve for Emphysema Palliation Trial (VENT study) [9, 10] was the first randomised controlled study to assess the effectiveness of EBV (Zephyr™ EBV; Pulmonx Inc., Redwood, CA, USA). Both the US  and European  cohorts showed modest improvements in lung function, exercise tolerance and QoL compared with controls. However, subgroup analyses performed on both sets of data revealed that the degree of lung volume reduction and the associated clinical improvements were far more pronounced in the patients showing complete fissures on computed tomography (CT) and where EBV placement had resulted in complete lobar occlusion. It is considered that collateral ventilation (CV) into the target lobe from the adjacent lobe(s) through collateral channels is the key reason why, in some cases, lung volume reduction is not achieved with EBV. The presence of complete fissures on CT between the target and adjacent lobes suggests an absence of CV to the target lobe [9, 11]. Therefore, assessment of CV prior to intervention could help in the planning of EBV placement into lobes without CV, thus maximising clinical benefit. The Chartis™ Pulmonary Assessment System  consists of a single-patient-use catheter with a compliant balloon component at the distal tip, which upon inflation blocks the airway. Air can then flow out from the target compartment into the environment only through the Chartis catheter's central lumen. By connecting to a Chartis console, airway flow and pressure can be displayed. Airway resistance can be calculated and CV in isolated lung compartments can be measured. The objective of this study was to determine whether Chartis assessment of CV can predict whether EBV placement results in significant target lobe volume reduction (TLVR) for individual patients. Common clinical outcomes were also assessed. From March 2010 to March 2011, patients considered appropriate candidates for an EBV placement were recruited from five clinics: three in Germany, one in the Netherlands and one in Sweden. None of these sites were participating in other trials that could have caused any bias in patient selection for this study. There was an enrolment limitation stating that only a maximum of 50% of patients from each site could be predicted nonresponders to EBV treatment (i.e. patients in whom CV was present); however, this limit was never reached, so no patients were excluded as a result. All participants had to provide written informed consent. Ethics committee approval was obtained from each of the participating centres. This study was registered at Clinicaltrials.gov (NCT01101958). Included patients were aged ≥18 yrs and had a diagnosis of late-stage heterogeneous emphysema (as assessed by visual read only of a CT scan by the investigator). Those with an active pulmonary infection, a forced expiratory volume in 1 s (FEV1) <15 or >50% of the predicted value, any coexisting medical problem that would contraindicate a bronchoscopic procedure, or who were participating in a trial on an investigational drug or device were excluded. In order to obtain a sample of patients that was representative of daily clinical practice, these were the only criteria used for patient enrolment. This was a nonrandomised multicentre prospective study. The primary objective of the study was to evaluate the effectiveness of Chartis in selecting patients who would benefit from EBV therapy. The primary outcome measure was the TLVR achieved. First, based upon visual read of the high-resolution CT (HRCT) scan, the lobe with the greatest destruction resulting from emphysema was identified by the study investigator in each centre. This was considered the target lobe for EBV treatment. In the rare event of bilateral disease of equal severity on HRCT, designation of the target lobe was left to the clinical judgment of the investigator. Secondly, prior to EBV placement, the pre-designated target lobe was assessed using Chartis to determine the presence or absence (CV+ and CV-, respectively) of CV. Regardless of these results, the choice of target lobe remained the same. The EBVs were then placed in segmental or lobar bronchi, with the aim of achieving complete lobar occlusion. Finally, at the 30-day follow-up, another HRCT scan was taken and used in conjunction with the pre-treatment scan to determine the TLVR by a blinded core laboratory. Before commencing the study, the investigators and core laboratory agreed that a TLVR ≥350 mL would be considered significant. This was on the basis that in the VENT study  the maximum TLVR in the control group (n=101; receiving standard medical care) rarely exceeded this level. Moreover, using the same data, estimates of sensitivity and specificity pairs showed that the ideal TLVR threshold associated with FEV1 response was between 300 and 400 mL (personal communication; T. Cornell, Pulmonx Inc., Redwood, CA, USA). A subsequent receiver-operating characteristic analysis found TLVR to be a significant predictor (p<0.0001) of FEV1 response at 12 months (personal communication; T. Cornell, Pulmonx Inc., Redwood, CA, USA). Based on the average lung volumes recorded in the Chartis feasibility study (1,800 mL)  and the VENT study (1,700 mL), a TLVR ≥350 mL is equivalent to an ∼20% reduction in lung volume . In addition, patients were requested to complete pulmonary function tests, the 6-min walk test (6MWT) and the St. George's Respiratory Questionnaire (SGRQ) before and 30 days after the procedure. For the responder analyses, those predicted to respond (CV-all) or not (CV+all) were broken down into responders (CV-responders and CV+responders) and nonresponders (CV-nonresponders and CV+nonresponders), where CV+ indicates that there is collateral ventilation and CV- that there is no collateral ventilation. A responder was defined as a patient who obtained a TLVR ≥350 mL regardless of CV status. Chartis has two components. 1) A balloon catheter that is inserted via the working channel of the bronchoscope. Inflation of the balloon occludes the airway, blocking the flow of inspired air and allowing air to flow out only through the central lumen of the catheter. 2) A console to display the flow and pressure readings in real time. If there is no CV to feed the airway distal to the balloon, air flow out of the lobe will gradually reduce. A continuous flow reading indicates the presence of CV in the target lobe. The Zephyr one-way EBV has been designed to effectively block airflow into the target lung region whilst allowing air and secretions to leave . The silicone valve is attached to a nickel–titanium (nitinol) self-expanding retainer that expands to fit the bronchial lumen without leakage from the retainer edges. If necessary, it can be removed . Multi-row detector HRCT scans were taken before and 30 days following the procedure. These were read and analysed by a blinded core laboratory. TLVR was determined as previously reported [9, 14]. Heterogeneity of emphysema was determined using a semi-automated computer-based quantitative analysis of HRCT scans, as described previously [9, 10]. The following clinical outcomes were assessed in each of the patients before treatment and at the 30-day follow-up: FEV1, 6MWT and SGRQ. Patients with a TLVR ≥350 mL were defined as having shown significant improvement over baseline values. For between-group comparisons, the TLVR of the CV- and CV+ groups were compared using the Mann–Whitney U-test (GraphPad Prism; GraphPad Software, La Jolla, CA, USA), and presented as median (interquartile ranges (IQR)), as data were non-normally distributed. Heterogeneity of emphysema was determined using a semi-automated computer-based quantitative analysis of HRCT scans as described previously [9, 10]. Density histogram analysis using a -910 Hounsfield unit threshold defined the emphysema involvement (%) in each lobe. The heterogeneity score was derived by the difference in emphysema scores between lobes. Clinical outcomes were judged in reference to the minimum clinically important difference (MCID). These were defined as an improvement of ≥15% in FEV1 , an improvement of ≥26 m in the 6MWT  and an improvement of ≥4 points on the SGRQ . Between-group data were compared using the Mann–Whitney U-test (GraphPad Prism). Of the 105 patients enrolled, nine were excluded. All of the 96 patients remaining underwent the EBV procedure (mean number of valves per patient=3.5; median=3; range=1–9). The number of valves used per patient was left to the discretion of the investigator, taking into account airway size and patient anatomy with the objective of achieving complete occlusion of the target lobe. Subsequently, 16 of these 96 patients were removed from the final analysis (six lacked HRCT, eight were lost to follow-up, and two died of unrelated causes) (fig. 1). This left a final population of 80 patients. Of these 80 patients, 51 were classified as CV- and 29 as CV+ using Chartis. There were no significant differences between the baseline characteristics of the two groups in terms of demographics or lung function (table 1). Flow chart of study patients. CV: collateral ventilation; EBV: endobronchial valve; HRCT: high-resolution computed tomography. The CV-all group had a median TLVR of 752.7 mL (IQR 218.2–1270.1 mL; 55.7%) that was well in excess of the level previously deemed to indicate significant clinical improvement (350 mL). In contrast, the CV+all group did not reach this level (TLVR 98.6 mL, IQR 26.8–232.1 mL; 5.7%). There was a significant difference between TLVR of the two groups (p<0.0001) (table 2 and fig. 2a). Comparisons of target lobe volume reduction (TLVR) between a) collateral ventilation (CV) absent (CV-) and CV present (CV+) groups and b) CV-responders, CV-nonresponders, CV+responders, and CV+nonresponders. Responders reached the primary end-point; nonresponders did not reach the primary end-point. Of the 51 CV- patients, 36 showed a TLVR of ≥350 mL, with a median TLVR of 1,061.4 mL (IQR 736.2–1,882.2 mL; 72.1%). In terms of predicting responders to treatment, this translates into a positive predictive value of 71% (table 2 and fig. 2b). It is noteworthy that, of the 36 CV-responders, 17 (47%) had valves implanted into the lower lobes. Also 14 (39%) had a heterogeneity score of ≤15% indicating a low degree of heterogeneity between lobes (table 1). Of the 29 CV+ patients, 24 were nonresponders (i.e. failed to show significant TLVR), and this was a response predicted by Chartis. This yields a negative predictive value of 83% (table 2 and fig. 2b). Clinical outcome data are presented in table 2. The CV-all patients showed a mean percentage increase in FEV1 of 16±22 from baseline values, and 43% achieved the MCID of ≥15%. In contrast, the CV+all group only showed a percentage increase of 1±15 (p=0.0013). The CV-responders showed a particularly strong percentage increase of 23±24, with 58% achieving the MCID of ≥15%. The improvement in 6MWT was greater in the CV-all group (24 m) than the CV+all group (10 m), but statistical significance was not reached (p>0.05). The CV-responders showed a greater response of 31 m, with 53% reaching the MCID of 26 m.
The CV-all group had a mean reduction in SGRQ score of 10 points, compared with a five-point reduction in the CV+all group. Between-group differences were not statistically significant (p>0.05). However, 68% of the CV-all group reached or exceeded the four-point MCID. The CV-responders achieved a mean reduction of 13 points, and 73% reached the MCID. Serious adverse events (SAEs) were defined as events requiring (or prolonging) hospitalisation, causing a serious deterioration in health or death. Chartis did not cause any SAEs. After EBV treatment of all 96 patients, 19 (20%) experienced an SAE. Two patients died; neither of these deaths was determined to be related to the study procedures. One patient died from a ruptured abdominal aortic aneurysm and the other following spinal surgery. Of the study completers (n=80), 14% experienced at least one SAE (table 3). Chartis showed positive and negative predictive values of 71% and 83%, respectively. This gives an overall rate of accuracy of 75%. Historically, LVRS has been restricted to the upper lobes as a result of the increased mortality in a subgroup of patients following lower lobe treatment in the NETT study . Data have been lacking regarding the efficacy of EBV placement in lower lobes. In this study, 17 (77%) out of 22 CV- patients with EBV placement in a lower lobe showed a TLVR of ≥350 mL. Lower lobes should therefore be considered as potential target lobes for EBV treatment. The inclusion criteria stated that only patients with heterogeneous emphysema could participate in this study. This assessment was made purely by a visual reading of the HRCT by the investigator. However, some patients were later re-classified by the blinded core laboratory as not having a high degree of heterogeneity (score ≤15%). Of the 20 CV- patients with a low heterogeneity score, 14 (70%) achieved a TLVR of ≥350 mL. This lends weight to the argument that TVLR is dependent upon CV rather than heterogeneity. It should be noted that in the CV+nonresponder group, 75% of patients were treated in the right upper lobe. This is consistent with current knowledge that there are frequently incomplete fissures between the right upper lobe and right middle lobe. Raasch et al. found that in 50 examined right lung specimens, there were incomplete fissures between the right upper lobe and right middle lobe in 44 (88%) specimens. In the CV-nonresponders group, 47% were treated in the right upper lobe. A possible explanation as to why some of these patients who were assessed as CV- did not respond may reflect the anatomy of the fissures between right upper lobe and right middle lobe. This may represent a specific challenge for assessment of CV. However, this hypothesis requires further research. Furthermore, the high incidence of CV between the right upper lobe and right middle lobe raises the question as to whether lung volume reduction and improved clinical outcomes in this patient population could be achieved by EBV placement in both the right upper lobe and right middle lobe, either simultaneously or sequentially. Another feature that was seen in a small number of patients was a “low flow” phenomenon. In this situation, the flow trace of Chartis reduced unusually rapidly after two to three breaths. Possible explanations for this are: 1) collapse of the bronchial wall distal to the inflated balloon; or 2) the presence of such large collateral channels that, upon balloon inflation, a reverse flow occurs causing air to escape from the target lobe into the adjacent lobe, thus giving a false CV- assessment. This should also be the subject of further research. Five out of 29 CV+ patients did actually respond to EBV treatment. It is interesting to note the baseline characteristics of these patients in comparison to the other groups. These patients tended to be older, but with higher mean body mass index and FEV1 along with lower mean residual volume. This is suggestive of a less severe disease state. These patients also achieved outstanding clinical results with 80%, 60% and 67% reaching the MCID for FEV1, 6MWT and SGRQ, respectively. Although the number of patients in this group was small, it raises a question as to whether some patients have specific pulmonary characteristics such that they can benefit from EBV therapy even in the presence of CV. One possible theory is that the collateral channels are of a relatively small calibre with high resistance. This, along with a relatively better preserved lung compliance, may result in the resistance to flow through the EBV being lower than that through the collateral channels, therefore resulting in lung volume reduction. Another possibility is that only one lobar segment has no CV with the adjacent segments, thus resulting in improved outcome after EBV treatment. Again, further research is required in this area. No SAEs were attributed to the use of Chartis. SAEs seen following EBV treatment were few, with pneumothorax being the most frequent complication encountered. All six patients experiencing pneumothorax had a significant TLVR, with five of these classed as “super-responders” (TLVR ≥55%). Patients experiencing pneumothorax were treated using standard procedures, and recovered in 3–14 days. Rates of pneumothorax were similar in comparison to the European (five out of 111) and US (nine out of 214) arms of the VENT study [9, 10]. Because this study was designed to validate the Chartis system, there are some limitations to the interpretation of the secondary functional end-points. By using a 30-day follow-up, patients may not have had sufficient time to increase their fitness level enough to show improvements on the 6MWT. The long-term 6MWT improvements shown by the patients in the study of Venuta et al. following EBV treatment lend weight to this possibility. Additionally, in view of the short follow-up period, this study is not able to demonstrate whether further improvement occurred after 30 days or if the benefit seen at 30 days was sustained. However, Herth et al. demonstrated that in their patients with complete fissures and lobar occlusion, results were sustained at 12 months. Furthermore, Venuta et al. have recently demonstrated sustained benefit to 5 yrs, and data from Hopkinson et al. suggested that atelectasis following EBV treatment was associated with a survival benefit. Finally, as there was no enrolment requirement for patients to undergo pulmonary rehabilitation or optimisation of medical treatment, the potential for variability in our sample was increased. The Chartis Pulmonary Assessment System is a safe method to predict lung volume reduction and has an accuracy of 75%. Lung volume reduction was associated with good clinical responses. This assessment system can be a useful tool to aid clinicians in planning EBV treatment. We gratefully acknowledge the help of D. McDonnell (study coordinator for Pulmonx; D Pulmonx Inc., Redwood, CA, USA) and J. Goldin (CT core laboratory analyses at MedQIA; Dept of Radiologic Sciences, David Geffen School of Medicine, School of Public Health, University of California Los Angeles, Los Angeles, CA, USA). This study was sponsored by Pulmonx, Neuchâtel, Switzerland. Writing assistance was provided by Archimed Medical Communication AG, Zofingen, Switzerland. This study is registered at www.clinicaltrials.gov with identifier number NCT01101958. World Health Organization. The global burden of disease: 2004 update. Geneva, World Health Organization, 2008.
. Global burden of COPD: systematic review and meta-analysis. Eur Respir J 2006; 28: 523–532. Standards for the diagnosis and care of patients with chronic obstructive pulmonary disease. American Thoracic Society. Am J Respir Crit Care Med 1995; 152: S77–S121.
. Global strategy for the diagnosis, management, and prevention of chronic obstructive pulmonary disease. NHLBI/WHO Global Initiative for Chronic Obstructive Lung Disease (GOLD) Workshop summary. Am J Respir Crit Care Med 2001; 163: 1256–1276.
. National Emphysema Treatment Trial: the major outcomes of lung volume reduction surgery in severe emphysema. Proc Am Thorac Soc 2008; 5: 393–405.
. Pulmonary rehabilitation in emphysema. Proc Am Thorac Soc 2008; 5: 524–529.
. A randomized trial comparing lung-volume-reduction surgery with medical therapy for severe emphysema. N Engl J Med 2003; 348: 2059–2073.
. Portable oxygen and exercise tolerance in patients with chronic hypoxic cor pulmonale. Br Med J 1977; 2: 84–86.
. A randomized study of endobronchial valves for advanced emphysema. N Engl J Med 2010; 363: 1233–1244.
. Efficacy predictors of endoscopic lung volume reduction with Zephyr valves in a European cohort with emphysema. Eur Respir J 2012; 39: 1334–1342.
. Predicting atelectasis by assessment of collateral ventilation prior to endobronchial lung volume reduction: a feasibility study. Respiration 2010; 80: 419–425. Pulmonx. CHARTIS™ Pulmonary Assessment System Catheter: instructions for use. Pulmonx, Redwood, 2011 http://pulmonx.com/en/products/zephyr-endobronchial-valve/zephyr-ebv-technology Date last accessed: November 29, 2012. Pulmonx. Zephyr Endobronchial System: instructions for use. Pulmonx, Redwood, 2011 http://pulmonx.com/en/products/chartis-system/overview Date last accessed: November 29, 2012.
. Design of the Endobronchial Valve for Emphysema Palliation Trial (VENT): a non-surgical method of lung volume reduction. BMC Pulm Med 2007; 7: 10.
. Outcomes for COPD pharmacological trials: from lung function to biomarkers. Eur Respir J 2008; 31: 416–469.
. Radiographic anatomy of the interlobar fissures: a study of 100 specimens. AJR Am J Roentgenol 1982; 138: 1043–1049.
. Long-term follow-up after bronchoscopic lung volume reduction in patients with emphysema. Eur Respir J 2012; 39: 1084–1089.
. Atelectasis and survival after bronchoscopic lung volume reduction for COPD. Eur Respir J 2011; 37: 1346–1351.